I offer your staff and students a glimpse into the disability experience and practical tips for interacting across ability lines. 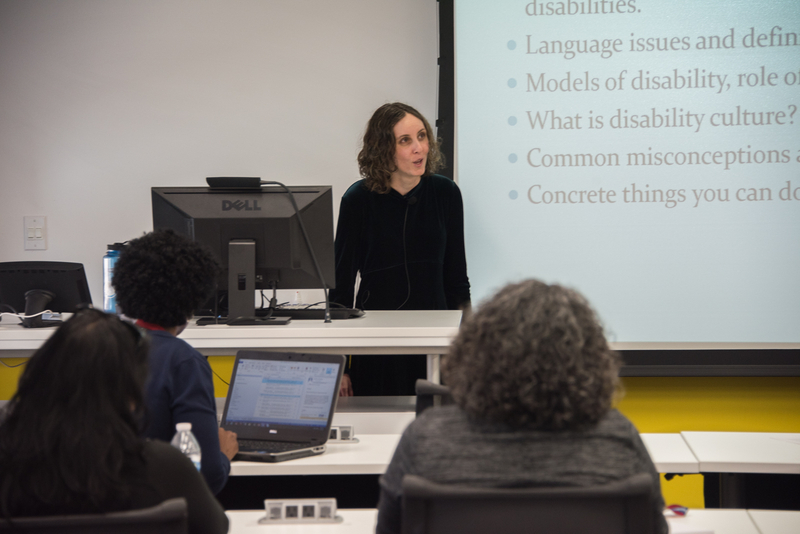 I provide disability cultural competency training workshops, developed specifically for healthcare staff and students to become more comfortable interacting with patients who have disabilities. Information about different types of disabilities. Adaptations that people with disabilities use to live independently, work, and enjoy life. What the research tells us about how people react emotionally to having a disability. Common myths and misconceptions about disabilities. Special concerns for people with hidden disabilities. Tips for making your services universally accessible. Etiquette considerations, such as appropriate language to use, how to address the disability, and how to offer help or accommodations. Opportunities to ask questions and dialogue with people who have disabilities. Resources to continue learning after the workshop is over. Do you want to offer your students accurate, insider knowledge about life with a disability? I offer disability awareness lessons for students of all ages, from the elementary grades to graduate school. Lessons are customized to your curriculum, and include discussion, hands-on learning, and direct contact between your students and people with disabilities. I am available to help your organization better serve and include people with disabilities. Contact Me to set up a complimentary conversation about your training needs. Knowledge is power. I can help your organization gather the data you need to set priorities, evaluate your program’s impact, and impress funders. Set your priorities: professional-quality surveys, focus groups, and interviews to discover what your constituents want. Evaluate your programs: state-of-the-art techniques to test your program’s impact and recommend improvements. Impress your funders: Customized evaluation plans to include in grant proposals, and reports highlighting your accomplishments on completed projects. Research has important implications for disability policy and practice. But original research reports can be long, use technical language, and can be difficult to access without connections to a university. Plain language summaries: brief written summaries of single studies, written specifically for consumer, practitioner, or policymaker audiences. Fact sheets: user-friendly summaries of current research on a particular topic. Literature reviews: more detailed syntheses of the research evidence on a particular topic.